Blog — Flathead Wildlife, INC.
A friend ran into a guy he knew coming out of a gas station/convenience store. The other guy had just bought his fishing license and was griping about the cost ($21 resident season). Jerry was quick to point out the 18 pack of beer under the guy’s arm had cost almost that much but would be gone in a day or two except for a lingering hangover while his fishing license would be good the next 11 months. I think hunting and fishing licenses are one of the best bargains going. Of course, my white hair now qualifies me for a senior license at $10.50. The 6 fishing trips I’ve taken already have amortized to $1.75/day. My goal is to get it down to 25 cents/day which works out to 42 trips. A worthy goal. Like many of you, when I started fishing the statewide regulations were printed on the equivalent of one newspaper sheet or 4 pages. And 1/3 of that was a map. The 2019 fishing regulations run 100 pages. That draws lots of complaints about complexity. Well, I’m biased because for nearly 40 years I was one of the guys who used to dream up those regulations. Despite the grumbles, Montana’s regulations aren’t too bad and in fact, won a national award a few years back. I fish in several states and Canadian provinces. Believe me, Montana’s regulations could be worse. But I’m sympathetic, when I go to another region or state, I have to spend some time studying the regs. Regulations could be much simpler. But the focus would be the lowest common denominator, the regulation that protected the scarcest species. Around here that would be bull or cutthroat trout so the regional limit would be 1 fish or catch and release. That would do away with a lot of opportunity. Native fish regulations are usually conservative and make up about half the exceptions. The alternative is getting a species listed under ESA, that would not be good. For all the pages of regulations they really break down into 6 categories beyond standard limits and seasons: closed seasons; catch and release or lower daily limits; more liberal daily limits, minimum length; maximum length, or a slot limit. FWP tries to standardize the sizes within any limit type. And, of course, you need to be able to identify fish species since limits may vary between species within the same water. If you know where you’re at, can identify species and spend time to understand the limit, you could come home with 50-100 fish a day if that’s your goal. The alternative is 1 fish daily. One of my former colleagues used to joke we should just set a regional size/number limit, say 30”. Each day you would lay all your fish nose to tail and when you reached 30”, you quit. So you could have one 30 incher, two @ 15”, a 14 incher and two 8 inchers, etc. It kind of works out. Every year everyone could wrangle over what the number should be for that year. It would sure make the regulation book slimmer. Fish, Wildlife and Parks does a major review of fishing regulations every four years, starting now. So think about regulations that could be clarified, that you don’t think are doing any good. Also, identify fisheries that might benefit from a change in regulations. Most people just offer up a regulation: e.g., catch and release or a 12”-16” slot limit. That’s a solution that might not fit the problem. It is better for FWP if you identify what the problem is (fish are too small or catch rates low) and what your goal is (12” average size or catch 1 fish/hour). The reason for doing that is to identify the best regulation alternative and there might be a non-regulatory solution. I had one angler (25 years ago) who wanted catch and release for lake trout on Flathead Lake. His complaint was the fish were too small. The actual problem was that the fish were too abundant, we actually needed to harvest more to let the remaining fish grow better. His proposal would have actually made the fish smaller. But I could never convince him that raising the limits was the better solution. FWP will be setting regulations for 2020-2024 so contact them or FWI. The preceding comments are mine alone and don’t necessarily reflect the policies and goals of Flathead Wildlife, Inc.
Dreams. Right now I’m dreaming of bare ground (or mud), maybe even green grass. After an easy December and January, Old Man Winter descended with a vengeance in February with snow and cold and it’s lingering into mid-March. Let’s hope the deer and elk saved enough fat reserves to make it through this latest nasty weather. The 1st day of Spring is only 11 days away! It’s also time to start dreaming about hunting and fishing in the coming months. March 15 is the deadline for what’s commonly called “Bucks and Bulls”. There are some restricted hunting districts in Montana that can yield outsize mule deer and elk – if you’re lucky enough to draw a permit. Permits modify your general tag to let you take an animal that is not under general regulations. The odds of drawing are long, sometimes under 1%, but someone has to draw and you won’t strike it rich if you don’t apply. I had a Breaks bull tag several years ago, I’m hoping strikes twice because it was an outstanding hunt sighting multiple 6 point bulls. Be aware this year that some districts that offered B tag (antlerless) elk tags last year in Regions 1,2 3 and 6 have gone to antlerless elk permits and you have to apply by March 15. Unfortunately, the Big Game Regulations haven’t been printed yet due to some goof but are available online so check so you won’t be sorry. Next up will be moose, sheep, mountain goat and bison applications by May 1, then antelope, deer and elk B tags applications by June 1. The other dreamers are young would-be hunters. After years of watching Mom and Dad, big brothers and sisters go hunting and maybe tagging along, now they’re eligible to hunt themselves. I attended a FWP Hunter Education Instructor workshop yesterday. Looking at the years of dedicated experience in the room, the future of hunting is in good hands. Hunting accidents in Montana dropped sharply when Hunter Education was made mandatory in 1957. Region 1 has 3 instructors who taught those first courses. Hunting garments with 400 square inches of hunter orange above the waist became mandatory in 1972 and caused another major drop in hunting accidents, particularly where hunters were mistaken for game. 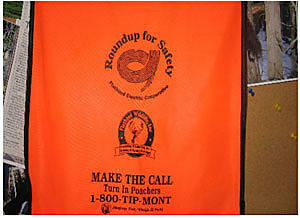 Flathead Wildlife, Inc. supports this important safety factor by partnering with Flathead Electric’s Roundup For Safety to ensure every Hunter Education graduate in Flathead County receives a hunter orange vest like the one pictured above. You’ll see lots of those vests in photos of young hunters in our fall “Preserve the Tradition” ads. The other interesting statistic from the workshop is that Montana is bucking the nation-wide trend of dropping hunting license sales with increased participation. 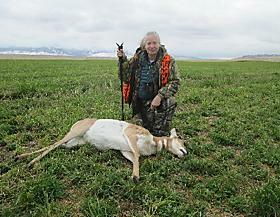 One of the prime factors is the increasing number of women hunting. So, dream of warmer days, some fishing, maybe some camping. But don’t get so lost in your daydreams that you forget to apply for next fall’s hunting licenses. And, by the way, it’s time to get all your 2019 licenses so you don’t get stalled on a last minute trip because of no license or you’re watching a warden walking towards you and you’re desperately trying to remember if you bought your new licenses. Here’s to turning dreams into memories. The preceding statements are mine alone and don’t necessarily reflect the policies of Flathead Wildlife,Inc. Spring is coming and so are the bluebirds. Have you seen any? 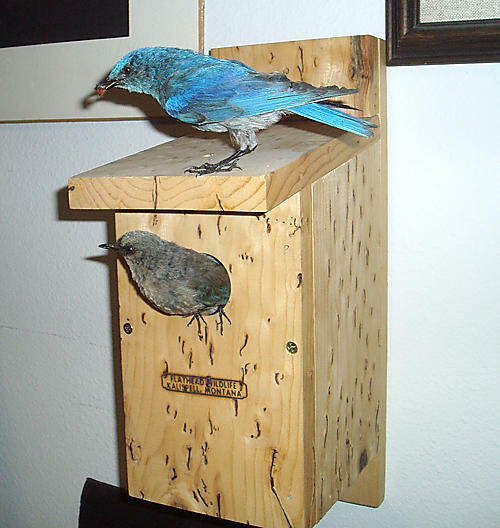 Now is the time to purchase bluebird nesting boxes. The Flathead Wildlife Inc. have put together hundreds in preparation for their return. 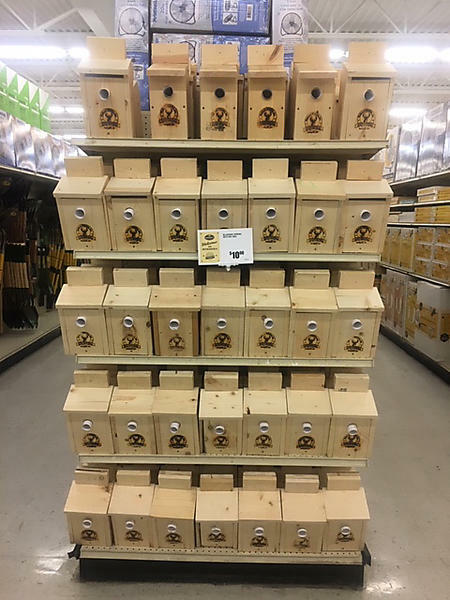 The Kalispell FWP made a display to honor Warren Lamoreaux who built thousands of these boxes for FWI. BBNB are on sale at Murdoch’s (Kalispell and Columbia Falls) and at CHS Cenex for $10. Yes, I hunt/fish like a girl. 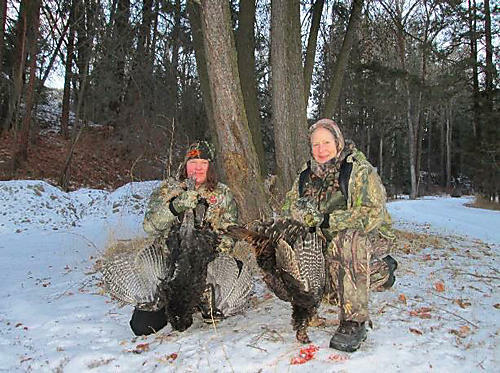 Well, that doesn’t refer to me but refers to women like Laura Nyberg and Sandi Vashro pictured below – spent two cold mornings to bag some turkeys. It’s no secret hunter and angler numbers nationwide are flat or declining. That’s a huge concern because hunting and fishing license dollars and excise taxes on sporting gear are used to fund fish and game management agencies. Even more concerning are the many threats faced by fish and wildlife populations. 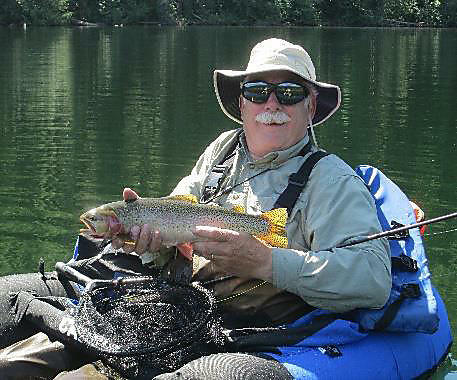 Hunters and anglers have been great advocates for wildlife, pushing awareness and pushing politicians and agencies to conserve and enhance fish and wildlife and their habitat and protect public access. The North American Wildlife Conservation Model and the recovery of fish and wildlife populations in the last century is a great success story, a movement pushed and funded by sportsmen and women. But many hunters and anglers are graying out and younger people don’t seem to be inclined to outdoor sports. And younger people definitely are not inclined to join sportsmen organizations. 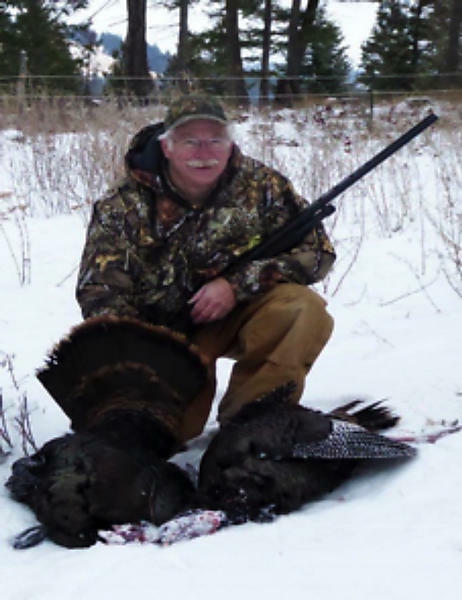 The collective power of groups like Flathead Wildlife, Inc. magnifies and focuses our separate voices “To preserve and enhance our hunting and fishing heritage”. What are the solutions? We can each mentor younger people. Programs like “Hooked on Fishing” introduce youngsters to fishing and aquatic habitat at a young age. Flathead Wildlife’s own “Preserve the Tradition” youth hunting campaign is aimed at encouraging young hunters. One group that is under-represented in the outdoors is women. Montana does better than most states but there are still about 3 times as many men as women hunting and fishing. But there’s no clear reason for the disparity. Women are the fastest growing demographic sporting group across the nation and that’s a good sign. What drives women to participate, what obstacles are there, what can we all do to encourage more women to come afield? At the Membership meeting Wednesday, February 13 we will look at the status of outdoor recreation in Montana and also have some notable women hunters and anglers tell us how to encourage more women in the outdoors. And there are programs like Becoming an Outdoors-Woman (BOW) sponsored by Fish, Wildlife and Parks. 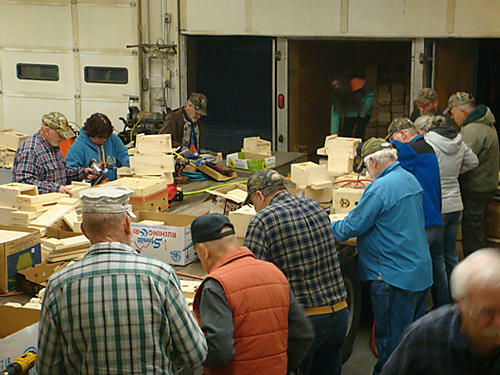 Flathead Wildlife will help sponsor a BOW ice fishing workshop on February 15-16 in Kalispell. Looking for a Valentine’s gift for your sweetie? Give her a certificate to the BOW workshop. She won’t be expecting that, who says you can’t still surprise her? I know a Methodist minister, his wife played music during his service one fine Sunday. Afterwards they went out and got a load of firewood. She shot a deer, they threw it on top of the load. And that night she gave birth to their son. Yes, I hunt like a girl.